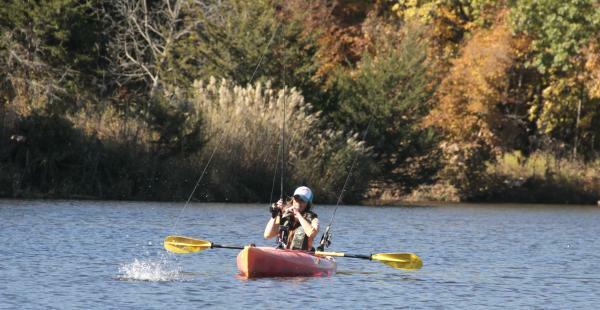 Kayak fishing maybe the best thing to hit Kansas angling since the invention of push-button reels. They’re fun to float, affordable, easy to transport and can greatly increase catch rates. They come in all sizes, colors and styles. Prices range from less than $100 to over $5,000. A good entry-level fishing kayak can be found for $400 or less. Do some research and don’t buy anything you haven’t paddled on the water. If you’re small framed, a 13-footer might be too hard to carry and load by yourself. If you’re 6’ 4,” a ten-footer will have your knees up in your ears when you sit. The wider the base, usually the more stable the kayak. It also means the craft will be heavier and tougher to paddle. Rather you buy a sit-in or sit-on top of kayak is personal preference. One offers more protection and stability. The other makes it easier to move around and gets anglers a few inches higher for easier casting. Try both. Rod holders and water-proof storage compartments can be handy and worth the extra cost. Kayaks with foot pedals allow for hands-free propulsion to maximizes fishing time and makes trolling easier. Again, for a price. Talking to experienced kayak anglers can save research time and money. They can be found at most lakes on a nice spring or summer day. Kayak fishing tournaments, which can concentrate 20 or more serious anglers in one area, are common. Be at the take out after a contest and you’ll find people to answer questions and probably allow a test float in their craft. Go to Facebook and check into the North East Kansas Kayak Fishing, Air Capital Kayak Fishing and Mo-Kan Kayak Fishing pages to make contacts and learn of tournaments. People in these groups are sometimes selling good fishing kayaks so they can upgrade. 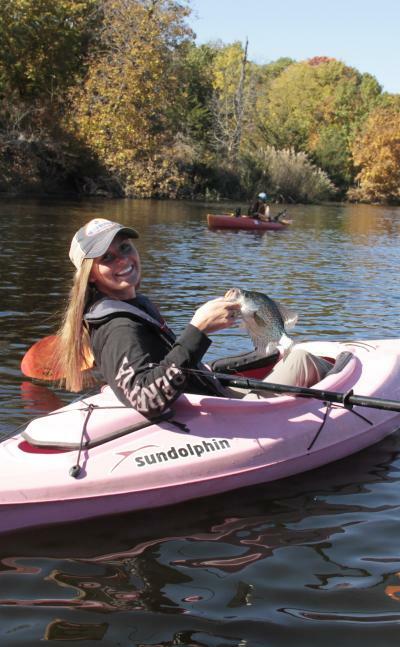 It’s a great way to save money and get an angling-ready kayak. Most important is a quality personal flotation device. Capsizing today’s kayaks is rare, but it can happen. Try on several styles of vests and buy one that’s comfortable enough to be worn all the times...then wear it. It can save you from drowning and also makes recovering gear much easier should a tip-over happen. Never forget to bring, and use, insect repellent and sun screen. A light, water-proof jacket is always good. Also, remember to dress for the temperature of the water and not the air. A small, waterproof bag, the kind that rolls down from the top, is a perfect way to keep things dry. Always have a bright light in case you’re fishing in twilight or darkness. Regs say it doesn’t have to be on all the time, but you must have one to signal boats coming your way. Headlamps work well. There are tens of thousands of options, including hundreds of community, county, state and federal lakes and reservoirs. Plus, Kansas has over 100,000 privately-owned ponds and small lakes for those who can get permission. Smaller lakes and ponds are the most easily fished by beginning kayak anglers. They’re more protected from the wind. Many don’t allow power boats to make wakes, which helps a lot. Lakes with boat ramps or beaches make it easier to launch kayaks. Keep things simple. Only take a rod and reel that’s easy to use and just enough tackle to get by. Make sure everything is firmly attached to the kayak. Make your casts short and smooth at first. It’s best to target fish, like bluegill, crappie and small bass so you can get a lot of action and experience the first few trips. 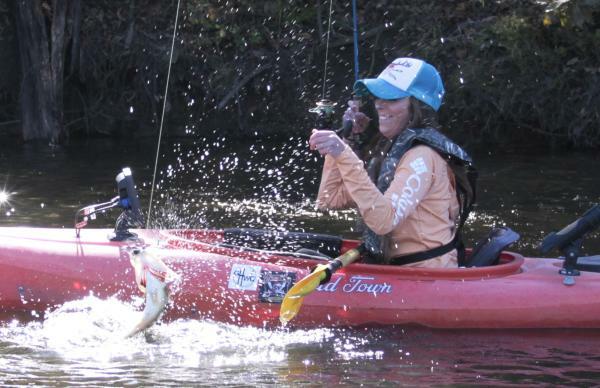 Skills, confidence and success will come quickly with kayak fishing in Kansas. Within a few trips you’ll probably be enjoying the best angling experience of your life. Before you know it, you’ll be the one offering encouragement, advice and test floats to others. It’s an experience too good not to share!